You’ll see, taste and learn about tropical fruit from around the world that we grow right here. Tropical Fruit World is an attractions unlike any other. There are tons of exciting attractions and activities to enjoy. Have a blast and try the Plantation Pavilion and Park Tour, Plantation Safari, Fruit Tasting, Fauna Park, Wildlife Boat Cruise, Miniature Train, The Island, Fruit Market, Plantation Café and many others. Indulge your senses and experience a world of shopping, sampling, dining and more in the Plantation Pavilion. Have your fill of exotic and succulent fruits. Explore the plantation with one of the tour guides on a Plantation Safari. You’ll enjoy a fully guided tour of the farm by tractor train. It’s a journey through orchards where more than 500 of the world’s weird and wonderful fruit varieties are grown. Relax aboard our boat the “MV Waterdragon” as you cruise through a waterway teeming with native wildlife. Be sure to enjoy the Wildlife Boat Cruise. Cruise past lush plantings of native fruit trees, gingers and waterlillies, keeping an eye out for our kingfishers, tortoises and of course, waterdragons! Take a break and stop by the Plantation Café. 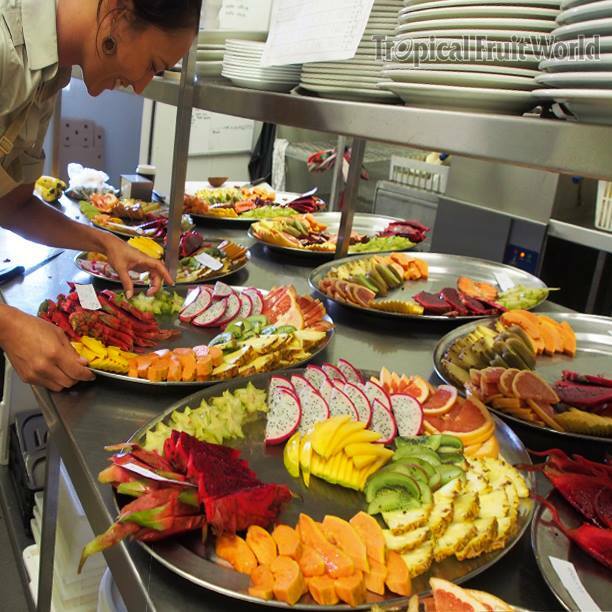 The café is famous for their ‘design-your-own’ fruit ice creams and black sapote lamingtons, but the menu also offers a range of healthy, simple farm fare for lunches, made fresh for you from local produce. Try their sumptuous fruit parfaits and desserts. Enjoy the birds’ eye view over the orchard treetops when you stop for a bite to eat in the Plantation Café. Tropical Fruit World is just a few minutes away from our Cabarita Beach Resort. Aside from our fully self contained apartments, we also have guest facilities for your comfort and convenience. The guest facilities include two outdoor swimming pools, a fitness room, day spa, restaurant and bar, barbecue facilities, business centre, conference/meeting room, direct beach access, dry cleaning/laundy services, secure parking, spa, tour desk, WiFi access, and more.